The Horse & Jockey - Wessington, Derbyshire. Back in December, The Horse & Jockey in Wessington re-opened it's doors after undergoing an extensive refurbishment and it's purchase by the same people who own another restaurant I've reviewed before, The White Hart at Moorwood Moor. Me and my friend Emily took a ride over on a Saturday lunch time to chance a walk in table. When we arrived, it was great to see the car park quite full, usually a good sign, and the we rushed inside to escape the cold. The interior of The Horse & Jockey is very similar to that of it's sister with the exposed brickwork and chunky wooden furniture. There's a copper theme throughout which you might be able to spot from the draught fonts which gives it that extra dash of class. I also spotted these delicious looking homemade sausage rolls on the bar. We were told there'd be around a 45 minute wait for a table which was fine by us, we just grabbed a drink and chatted in the bar. 20 minutes later, one became free and we able to take a seat. Our table was in the ground floor restaurant as opposed to their second one down in the basement. After comparing the two, I'd have preferred to sit in the basement as it had more of a cosy, relaxed feel. The ground floor restaurant felt very much like a canteen. The menu is surprising extensive with a range of snacks, lighter bites, twists on pub classics and a children's section too. I went for the Roasted Butternut Squash Risotto topped with a dollop of Creme Fraiche which from the moment I scanned through the options, I knew this was the one. I absolutely love Risotto and as you'd expect, it was very filling - I couldn't manage the whole dish but it was lovely. The Butternut squash had a slight crunch to it, the rice was full of flavour and the Creme Fraiche finished it off perfectly. Thumbs up from me. 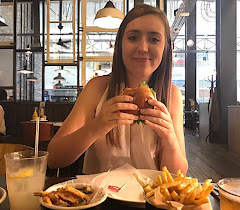 After debating whether to have Fish & Chips or The Jockey Burger, Emily chose the latter. Served in a Brioche Bun with Bacon, Cheese and a Smokey Relish, you can't really go wrong with The Jockey Burger. I had to steal a chip though, I couldn't not. Again, very nice. Crispy and fluffy. For me though, it's all about the dessert no matter where I visit. I was originally going to go for a Sticky Toffee Pudding but after finding out it has Dates in it, I opted for my back up, a Chocolate Brownie Sundae with Crushed Honeycomb and Caramel Sauce which is served in a Kilner Jar. I definitely had eyes bigger than my belly for this one. I was determined to polish it off but it became too sickly. The Honeycomb was amazing though. I could've eaten a bunch of that all by itself. This is definitely my idea of the perfect dessert. After a friendly chat with the manager, we settled the bill and headed back home. The new and improved Horse & Jockey is certainly a welcome addition to Wessington, especially following the closure of The Peacock, Oakerthorpe just down the road. I'd definitely return, but I'd book and I'd also ask for a table in the Basement. As well as a restaurant, there are also fourteen boutique country style rooms which you're able to stay in. I didn't get a chance to look around them, but from the images I've seen online, they look stunning. Something to bear in mind if you're after accommodation in the area or just a little overnight getaway. Yum! The food here looks good but I'd have definitely gone for the fish and chips. I'm not usually a sausage roll person either but the image of those homemade sausage rolls has me drooling!